Update 4/3/2019: Beijing has denied sending troops to Venezuela. "I don't know where you got this information or for what purpose was it produced, but I can tell you this: what you said is simply not true," said Foreign Ministry spokesman Geng Shuang on Tuesday. "The Chinese government's position on the Venezuela issue is consistent and clear-cut," Shuang added, noting that China opposes "external interference in Venezuela's internal affairs, and believe the country's government and opposition need to seek a political solution through peaceful dialogue." It doesn't appear last Friday's strong warning from national security adviser John Bolton for countries "external to the Western Hemisphere" to keep their militaries out of Venezuela had the intended effect. Bolton's and other White House statements saying "Russia has to get out" came following Russian Air Force planes landing in Caracas with about 100 troops, which the Kremlin said were there as "specialists" servicing existing defense equipment contracts. 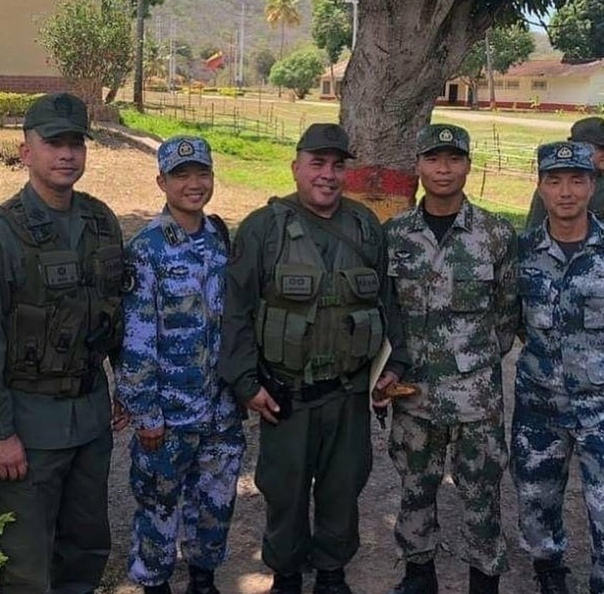 And now according to Al-Masdar News, citing defense analyst photographs and local reports, "more than 120 soldiers from the Chinese People’s Liberation Army arrived at Venezuela’s Margarita Island to deliver humanitarian and military supplies to the government forces." The military flight appears to have touched down on Sunday, two days after a prior Chinese cargo plane delivered 65 tons of medicine and other aid to Venezuela. The Chinese troops are also there ostensibly to assist with the humanitarian mission, but it appears Beijing is also now alongside the Russians pushing back against Washington ultimatums to stay out of Venezuela, after repeatedly condemning any external coup plotting against President Nicolas Maduro. "We strongly caution actors external to the Western Hemisphere against deploying military assets to Venezuela, or elsewhere in the Hemisphere, with the intent of establishing or expanding military operations," Bolton had warned in his statement. Secretary of State Mike Pompeo had also last week accused external actors of assisting Maduro in "plundering" the already cash-strapped and impoverished Latin American country, stating in a tweet: “Maduro calls for hands off Venezuela while he invites security forces from Cuba and Russia, so he and his cronies can keep plundering Venezuela. It is time for Venezuelan institutions to stand for their sovereignty..."
The Maduro government has repeatedly blocked attempts of US aid from entering the country; however, late last week the Red Cross announced it now has unhindered access to bring aid into the increasingly desperate country amidst medieval conditions, of failing power and water infrastructure. Red Cross officials plan to begin delivering aid to "650,000 people within 20 days" —something which both sides, Maduro and Guaido supporters — are claiming as a victory. Meanwhile, as Al-Masdar comments of Beijing's sending its own troops in to assist: "These moves by the Russian and Chinese armed forces appear to be a powerplay against the U.S. administration, who is actively pushing to remove Venezuelan President Nicolas Maduro from power." 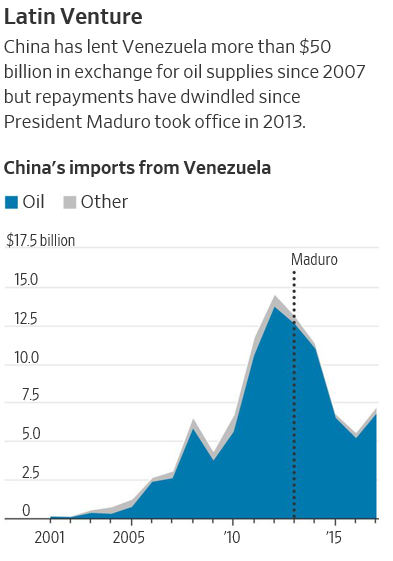 And we previously highlighted the not so minor issue of China over the past decade lending over $50 billion to Caracas as part of an oil-for-loan agreements program. It underscores just how quickly what appears a new White House full court press for regime change could bring Washington again into indirect conflict with both China and Russia. And in total Venezuela owes "more than $120 billion just to China and Russia" according to a FOX report. Both China and Russia further remain the Latin American country's biggest arms suppliers and Beijing had an additional $3.2 in direct investments in Venezuela in 2017, not to mention at least three joint ventures between between China National Petroleum Corp and Venezuela’s now US-sanctioned state oil company, Petróleos de Venezuela SA, or PdVSA. China’s investments are now at risk under Mr. Maduro—and Beijing also recognizes that a U.S.-backed Guaidó administration might refuse to honor outstanding debts. China’s Commerce Ministry spelled out this concern on Tuesday. “If the opposition party holds power in the future, a new Venezuelan government could use ‘protecting national interests’ as a reason to renegotiate contract terms with China and even just refuse to repay remaining debts,” the ministry said in its latest investment guidance report on Venezuela. Given that Beijing is all to aware of the outcome to any Venezuelan transition of power, and given it remains the Maduro regime's top weapons supplier, there's no telling what kind of possible clandestine military-to-military cooperation or contingency plans are already in effect. Similar to China's quiet military support to Syria's Assad throughout the past years of international proxy war in the Levant, which has gone increasingly public, China could be gearing up to support Maduro in a more direct capacity.